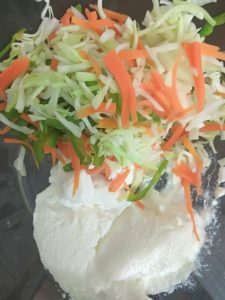 A healthy and easy break fast/ snack/ lunch box recipe. 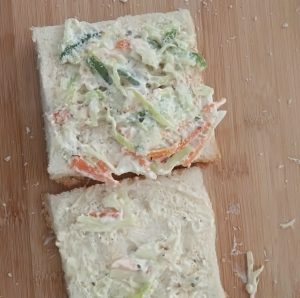 Sandwich with vegetables, hung curd and mayonnaise sprinkled with origano adding a distinct flavour. 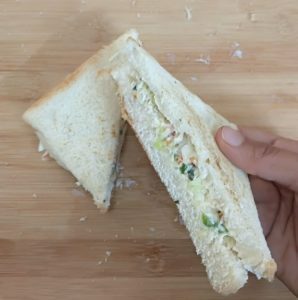 Prepare the vegetable hung curd mixture overnight and refrigerate to make this sandwich in minutes in the busy weekday mornings. 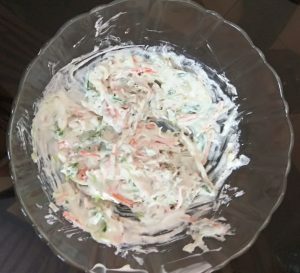 In a mixing bowl mix together hung curd, mayonnaise, vegetables, with oregano, chilly flakes. Sprinkle some salt and mix well.Take the bread slices and cut the edges. Spread the mixture over one slice and cover with an another slice. 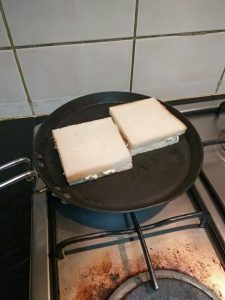 Heat a tawa and spread some butter, now toast the sandwich on both side. 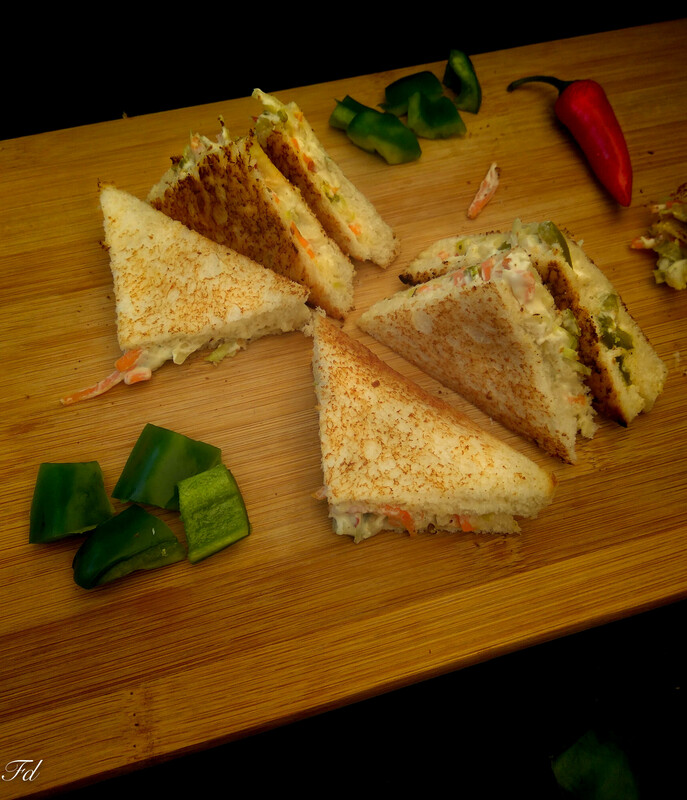 Sandwiches are ready to serve. 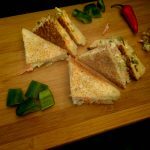 Cut the sandwiches into wedges to serve. 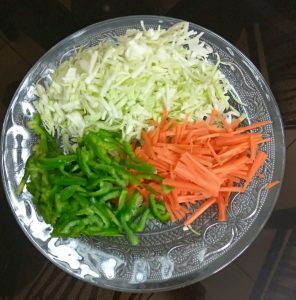 *Slice the vegetables in very thin 1 inch long julienne for better taste. 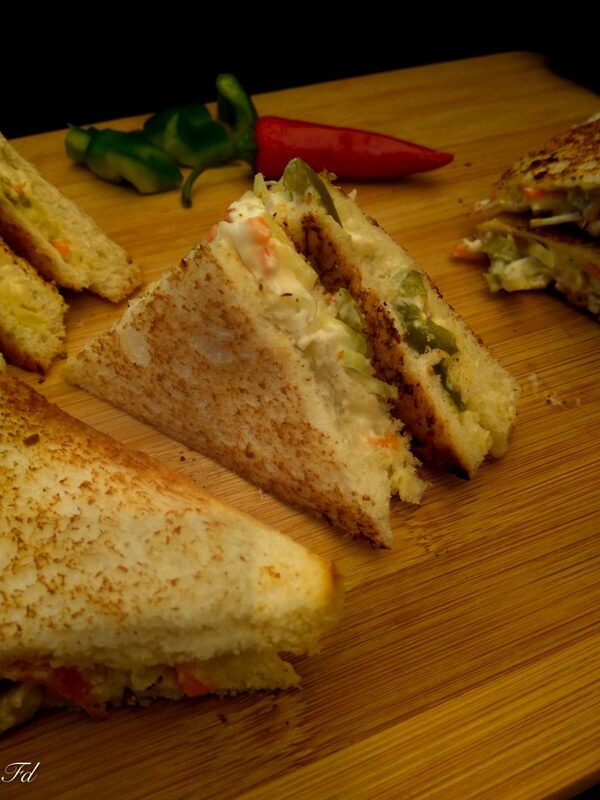 Or else the capsicum might taste raw and spoil the taste of sandwich. Spread muslin cloth over a colander, add yoghurt and tie the cloth and hang it keep a bowl below to collect the whey. Leave it for an hour. 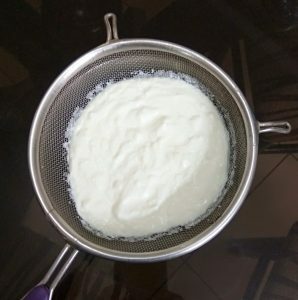 Hung curd is ready. I have used directly in a strainer here as my strainer had very fine holes. 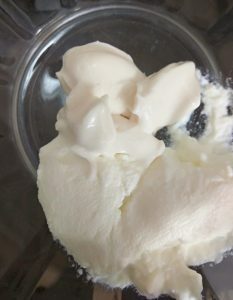 After an hour refrigerate the hung curd for 1-2 hours. 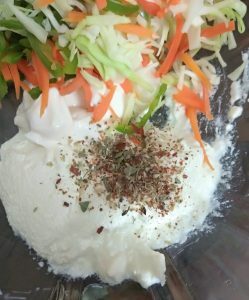 In a mixing bowl mix together hung curd, mayonnaise, vegetables, with oregano, chilly flakes. Sprinkle some salt and mix well. 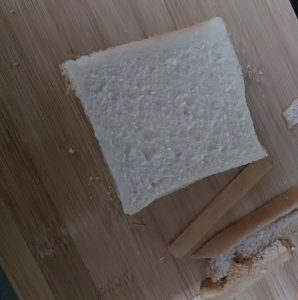 Take the bread slices and cut the edges. Spread the mixture over one slice and cover with an another slice. Heat a tawa and spread some butter, now toast the sandwich on both side. Sandwiches are ready to serve. 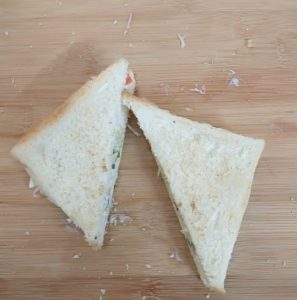 Cut the sandwiches into wedges to serve.